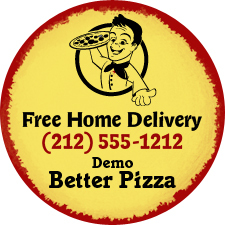 Circle your pizza information through these promotional 1.5 inches diameter circle shaped full color pizza magnets – 25 MIL. This magnet is made to last and you can stay assured that people are going to reach out you on all special occasions and also when hunger pangs start bothering them. These magnets work perfect for Italian themed restaurants or Italian restaurants, pizzerias, bakers and other individual businesses trying to market their pizzas. These magnets can be handed out on regular business days or food festivals depending on the choice. Request a quote to know price benefits that may fall in your kitty on bulk ordering these custom 1.5 inch diameter circle shape full color pizza magnets – 25 MIL. Product Size: 1.5 in. x 1.5 in.